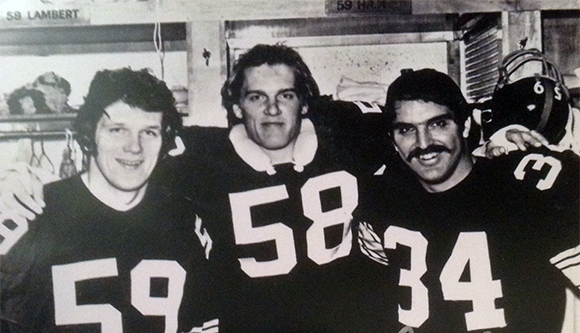 “The Colts were my pick all along to win it because of their front four,” continued Hanratty. “They don’t get as much ink as the Steelers do, but they’re as good. The whole key for them defensively is that front four. They’re big, tough guys. Dallas rushes the passer as well, but is susceptible to the run. The Baltimore guys are super talents and the Steelers are going to have to run against them. Hanratty considered Saturday’s game as the Steelers toughest. “New England and Oakland are inferior to the Colts, but I think the Steelers will win,” he concluded. Terry Bradshaw’s record in playoff games was 7-2 while his opponent Jones only had the experience of losing to the Steelers in his only appearance in 1975. Steelers J.T. Thomas knocked Jones out of the game in the first quarter, although he did come back in the final period. Still suffering with his wrist injury, Bradshaw was expected to run the ball more often than Jones. Tickets for the playoff game went on sale in Pittsburgh for $12. The Post-Gazette noted that Chuck Noll was exceptional in holding the Steelers together in times of adversity describing the two time Super Bowl winning coach as a builder and a teacher. When the team had slumped to 1-4 and were preparing to face the division leaders Cincinnati, Noll told his players, “Just go out there and have a lot of fun today. But when each player comes in after the game, he should be able to say to himself that he gave 100 percent. Don’t worry about anybody else. Just know that you’ve given 100 percent. As with football in the current age, turnovers could win or lose a game in the seventies. With the Steelers heading to Baltimore to play the Colts in the playoffs, veteran sports writer Pat Livingston wrote in the Pittsburgh Press that in a game where mistakes loom as the paramount factor in the outcome, the edge favoured the Colts. During the regular season, the Colts had fumbled 25 times as opposed as the Steelers 40. The Steelers also led in penalties, 111 as against the Colts 92. The journalist highlighted the third down efficiency of Colts with the Colts also ahead with a 54% conversion rate in contrast to the Steelers 40%. After evaluating the teams, Livingston still picked the Steelers to progress due to the resolve and intensity they had built over their nine game winning streak although it he felt it wouldn’t be as easy as in previous years. Marchibroda felt his team was more prepared than they were the previous year when they lost 10-21 to the Steelers and he also felt that home field advantage was a plus factor. The coach believed that the key for the Colts was stopping the Steelers running game. On the game’s opening drive, the Steelers tried something different. On a third and eight, John Stallworth came in for tight end Larry Brown, giving the Steelers three wide receivers and two running backs in spread formation. The Colts double-covered Stallworth leaving safety Jackie Wallace isolated one-on-one with Frank Lewis. The mismatch was confirmed when Lewis streaked past the safety as Terry Bradshaw fired the perfect pass. With Roy Gerela, who was suffering with a gland ailment, missing the extra point, the Steelers took a 6-0 lead with less than two minutes played. Mike Wagner’s interception on the Colts ensuing drive set Pittsburgh up for a 45-yard field goal. The Colts picked themselves up to march 69 yards for a score to reduce their deficit, but then the Steelers took over. On the subsequent kickoff, rookie Theo Bell returned the kick 60 yards and six plays later Reggie Harrison carried it over from the one. 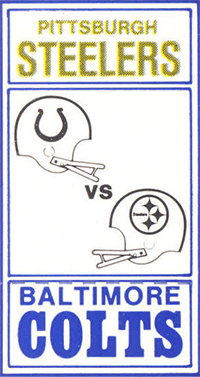 Despite a Reggie Harrison fumble on the Colts’ two, the Steelers continued to pile on the pressure with Lynn Swann collecting a 29-yard touchdown pass on their next drive. A Glen Edwards interception set up another field goal kick, this one from 25 yards that saw the Steelers lead 26-7 at halftime. A scoreless third period was followed by two more Steeler touchdowns. Swann added an 11-yard touchdown catch and Harrison made up for his earlier fumble with a touchdown run of 10 yards. Baltimore split those two scores with a touchdown run of one yard that saw the Steelers win 40-14. The Steelers finished with 526 yards of offense, the highest total under Coach Noll while restricting the highest scoring offense in the NFL to 215 yards. Citing five penalties called against New England in Oakland’s winning touchdown drive, Patriots owner Billy Sullivan said, “It’s one thing to get beat; it’s another to get robbed. That’s the worst I’ve ever seen. Colts quarterback Bert Jones said he was so disgusted that he would promptly return to his home in Louisiana and hide. Having strolled passed the Colts the Steelers now headed to Oakland to face their old adversaries the Raiders in the AFC Championship game. Bad blood still existed from the season opener after which Coach Noll accused his opponents of being thugs. The most vivid infraction from the game was George Atkinson delivering a “karate chop” to the back of Lynn Swann’s helmet. Fifteen weeks later, the animosity from the game still existed through the courts and on the field. “We’re going to have the intensity of a charging rhino and a herd of tanks,” is how Ernie Holmes (picture left) saw the matchup. “I’m so pumped up about this already, I’m having a hard time low keying it just talking to you,” he told the Pittsburgh Press. In the build up to the game, the major concern for the Steelers was the health of their running backs. Both Franco Harris and Rocky Bleier were listed as questionable with Noll confirming he didn’t know if they would play. Coach Noll was hopeful the Steelers offensive line would aid Harrison to fill the gap with Franco’s absence. “We like to think a big part of our running game is our offensive line,” Noll predicted. 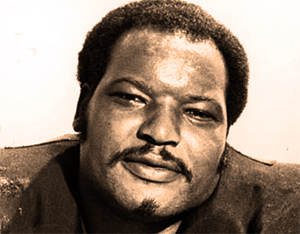 It wasn’t exactly news that hostility towards the Steeler player existed from Jack Tatum and George Atkinson who was in dispute with the team. But Davis suggested that even Skip Davis, who played with Swann at Southern California wasn’t exactly wild about his former teammate. If Swann wasn’t too high on the Raiders’ popularity list, Joe Green was even lower. Davis accused Greene of “infantile” remarks after Mean Joe went on record as saying he would play it any way that Atkinson wants to. “Greene is trying to become the Muhammad Ali of pro football,” said Davis. “I’m sure we’ve got many players who are willing to meet Joe halfway and get it straightened out before the game. The banner in the Coliseum read, “Swann Season Opens Today,” suggesting the Championship game would be full of the anticipated aggression that had been building in the lead up to the kickoff. 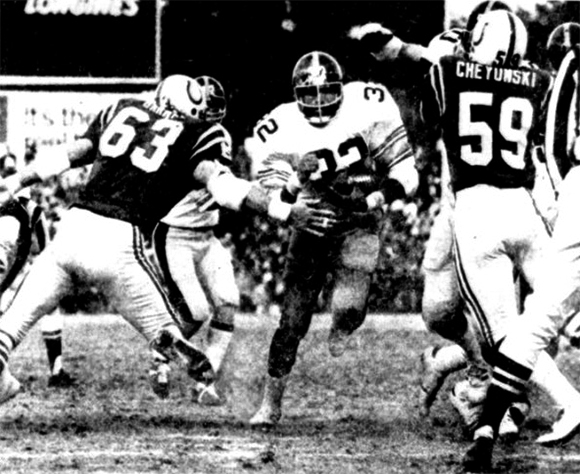 Without Franco Harris and Rocky Bleier, the Steelers lacked any ground game and struggled to put their offense together, failing to make a first down until the halfway through the second quarter. 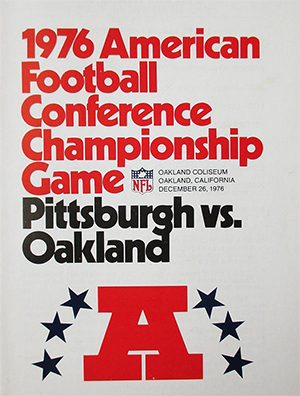 Turnovers were also absent, Jack Lambert just failing to recover an Oakland fumble in the opening exchanges. The Raiders were desperate to put the scourge that was the Steelers behind them and took full advantage of their opponents’ woes. Oakland took the lead in the first quarter with a 39-field goal after a Bobby Walden punt was blocked. A Terry Bradshaw interception in the second quarter returned 25 yards by Willie Hall gifted the Raiders a further seven points and suddenly the struggling Steelers were 10 points behind. When Bradshaw eventually found his feet, the Steelers game improved temporarily. 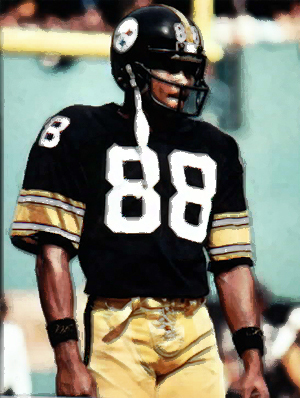 He led Pittsburgh on 75-yard drive that Reggie Harrison completed with a touchdown run from three yards with Ray Mansfield kicking the extra point. That was as good as it would get for the besieged Steelers as the Raiders dominated the rest of the game. With 25 seconds remaining in the half, on a third down Ken Stabler appeared to throw his pass out of bounds, but a late flag for holding on Steelers J.T. Thomas gave Oakland a first down on Pittsburgh’s four. Warren Bankston caught a touchdown pass to give his team a 17-7 halftime lead. The Steelers’ offense continued to with no first downs on the first two possessions keeping the momentum with Oakland who added another touchdown with a 5-yard catch for Pete Banaszak. The final period was scoreless enabling the Raiders to go to their second Super Bowl where they would beat the Minnesota Vikings 32-14. 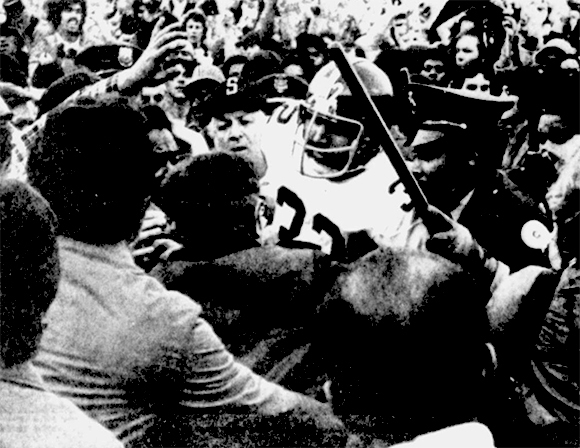 Pittsburgh Press photo of Franco Harris wading through the mob of Oakland fans. Coach Noll said it was his decision not to play Harris or Bleier and then went on to praise his team. “I’ll remember this team as long as I live,” the coach said. “They exemplified everything that’s good in football and it’s really a lousy end for this type of year… this type of team. Lynn Swann thought the game was one of the cleanest played between the two teams. 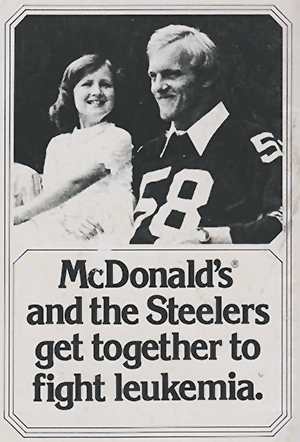 In the aftermath of the Steelers defeat in the AFC Championship game, the Pittsburgh Post-Gazette suggested the line between the best team and the second best is too close. One must also be blessed with good fortune, the right bounces and old fashioned luck. The Steelers were deprived of a running game with the absence of Franco Harris and Rocky Bleier, but on the day the Raiders came up stronger and would meet the Vikings in Pasadena. Russell played 168 straight games for the Steelers. The streak was in doubt when the Steelers played the Giants in October because he was suffering with a groin pull. Russell put himself on the field during an extra point. “I’ve never felt so absurd in my life,” he admitted. Following a 1-4 start, the Steelers turned their season around winning the last nine games of the regular season. Lambert was at the core of a Steelers defense that in a stretch that saw five shutouts and just 28 points conceded. After their fifth loss in five games at the start of the season, Lambert voiced, “I’ll tell you, when you lose, it doesn’t ruin your weekend. It ruins your whole week.” Mike Wagner suggested Lambert threatened to beat up every Steeler player if they didn’t start winning. 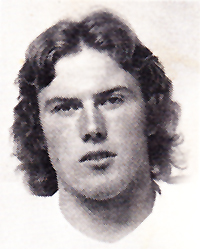 The Steelers picked up Lambert with only five seconds remaining of their allotted time in the ’74 draft. After being selected, he made it clear to the coaching staff that he wanted to start as a rookie. Even the player who worn the title of “Mean” Joe Greene thought Lambert was unique. “As soon as I met him and saw him play, I knew he was the kind of guy I wanted behind me if I ever got involved in an alley fight, “ said Greene. Lambert started every game in his rookie season and earned a reputation as an aggressive hitter. In Super Bowl X, Lambert took exception to the Cowboys safety Cliff Harris disrespectfully patting Roy Gerela on his helmet and thanking the kicker for helping Dallas out after missing a field goal. Lambert was also second to the Colts’ Bert Jones in the balloting for the league’s MVP award. Leading the NFC team was Chuck Knox, coach of the Los Angeles Rams. He suggested, “If we can’t be in the Super Bowl, this is the next best thing. I’d rather be second than 28th.” Voting for the participating players was done by the 14 coaches in each conference. Four Steeler players helped the AFC to a 24-14 triumph. Mel Blount intercepted two passes while Jack Lambert, Mike Wagner and Glen Edwards added one each. 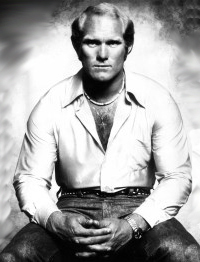 Terry Bradshaw’s singing career was due to take a boost as a special guest on a country and western bill at the Civic Arena at the end of January. The show was a late cancellation due to an impending snow storm that didn’t arrive. Three years of negotiations had not provided a permanent agreement, but the owners and the Players Association (NFLPA) appeared ready to resolve their differences at the beginning of 1977. The league’s negotiator Terry Bledsoe also sounded hopeful. “I think both side realise the urgency of the situation and are approaching it in a constructive manner,” Bledsoe said. “I like to think we are making real progress,” he added. Before his famous Coke commercial, Joe Greene was used by Ideal Toys to demonstrate the durability of one of its products, a toy truck. In the ad, Greene clobbers the toy as if it was an opposing quarterback, but he doesn’t dent it. Just over a year after being arrested in Amarillo for possession of cocaine, Holmes had the chance to defend himself in court. At his trial, three police officers testified they saw an unidentified man pass something to Holmes in the restroom of a motel. The officers had stopped to use the restroom by chance. After three days, the jury took just over an hour to decide that Holmes was innocent. The inconsistent evidence of the police and their failure to apprehend the man who sold Holmes the drug influenced the jury’s decision to find him not guilty. Chuck Noll, Dan Rooney and Andy Russell all testified they felt Holmes had a good reputation for telling the truth. “I’d like to give all my praises to Jesus Christ for standing and holding me strong,” Homes said after the verdict. Garvey, the executive director of the Association, walked out of a negotiation session, fuming that the owners had suddenly refused to discuss the major issues blocking a settlement and convinced no agreement was in sight. Dan Rooney became the peacemaker when he called at the NFLPA’s headquarters to talk over the situation and convinced Garvey to continue the discussions. Rooney’s intervention saw the continuance of the talks where progress was finally made. In mid-February an agreement was reached with the restoration of a modified draft and compensation system for free agents with the unions pledge to a no-strike arrangement and an end to costly litigation by the players. Commissioner Rozelle’s right to set the compensation for a free agent was revised to a fixed set of draft choices in recompense depending on the salary of the player. Draftees who couldn’t reach agreement with the teams that selected them were provided with alternate ways of continuing their careers in pro football. Following the settlement made with the players, at a later owners meeting it was agreed to change the makeup of the season’s schedule. The teams would play 16 regular season games and 4 exhibition games after a 21-7 vote. The owners agreed to expand the playoffs to ten teams with the addition of two wildcards. In an attempt to balance the strength of the schedule, all first place team would place first and fourth place teams while the second place would play the third place. It was thought that second and third placed teams would be battling for a wildcard spot in the playoffs so they should play identical schedules. In another move to consolidate teams, Tampa Bay was put in the NFC Central division and the Seattle Seahawks in the AFC West. The draft was limited to 12 rounds with all non-selected players free to deal with a team of their choosing. Having played for the Raiders and the Steelers during the ’76 season, Greg Blankenship had a unique insight on both teams. He was cut in the fifth week of the season and claimed by the Steelers who were looking for a 200-pound special teams player with a sub 4.9 speed in the 40. “I weighed about 202 and in the freezing weather ran a 4.85 and they said okay,” said Blankenship. “When I go back, it’ll be a different story,” he added although there is no guarantee he will still be a Steeler when the new season begins. After playing a minor part in the Buccaneers 0-14 season, former Steelers quarterback Terry Hanratty announced he was retiring. The 29-year old, eight-year veteran was retiring to pursue his business interests. Maybe in light of the Raiders/Steelers controversy regarding George Atkinson’s forearm attack on Lynn Swann in the 1976 season opener, the NFL passed a new rule regarding what defensive backs can do to receivers. The new measure allows defensive backs just one “jam or chuck” either three yards from the line of scrimmage or downfield. Previously, a defensive back could make contact with a receiver at the line of scrimmage and then again downfield. A decision on strengthening the rule against deliberately hurting an opponent was postponed until the next meeting. The owners did reach an agreement on instant replay deciding it was impractical. At the end of April, Coach Noll returned to Oakland to give a deposition defending his position in the lawsuit that George Atkinson had filed against him, the Steelers and an Oakland Tribune writer. Noll contended that he meant criminal only in the sense that Atkinson violated NFL rules. Having won back to back Super Bowls, it would be perceived that Steeler players would be on top wages, but indications suggested that was not true. A close source to the team suggested these were the highest earners with their years in the league in brackets. With Andy Russell retiring, there was a necessity for the Steelers to draft a linebacker. The Steelers philosophy was always promoted as selecting the best athlete available, but with a new for a linebacker, that viewpoint might be tweaked.